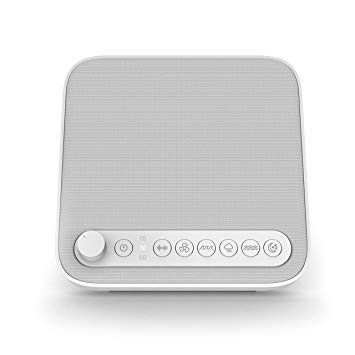 What is a White noise machine? 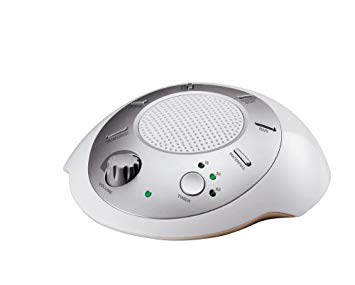 A white noise machine is a device that produces a sound with a random character, which sounds like a rushing waterfall or wind blowing through trees. More than thirty percent of modern adults do not get enough quality sleep every night. Getting enough high-quality sleep is one of the most important ways to take care of yourself. Sleep deprivation–even minor deprivation–leads to more stress, irritation, depression, as well as physical health problems like weight gain. Unfortunately, solving the problem of getting enough sleep is not always as easy as getting into bed earlier or setting your alarm later. Many people have trouble falling asleep and staying asleep, so they end up tossing and turning all night long without ever sleeping much at all. Whether you live in a noisy place or can’t seem to relax enough at night to get some much-needed shut-eye, a sound machine can help. Sound machines play soothing sounds that both block out disruptive noises around you and help you relax and fall asleep peacefully. Unlike sleeping pills, running a sound machine while you fall asleep is a harmless solutions to sleep deprivation. 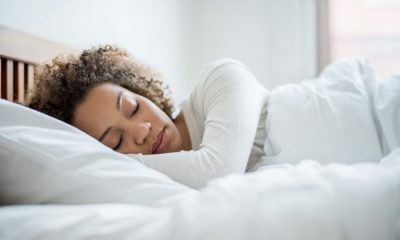 Before you turn to drugs or other unhealthy habits to fix your insomnia, try one of these white noise sound machines to sleep longer and better, naturally. 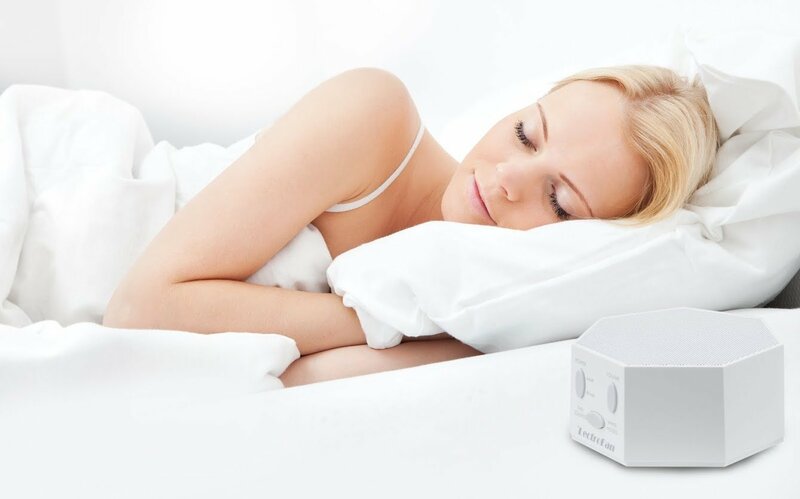 Soothe yourself to sleep every night with one of the twenty sound options available I this small, lightweight sound machine. These twenty sound options include sounds from three different categories: white noise, fan sounds, and nature sounds. This machine offers eight different simple and soothing nature sound options–stream, birds, campfire, ocean waves, rain, etc.–six white noise sounds, and six fan sounds. Choose your sound type, adjust the volume, and set using the clear button controls located on top of this sound machine. The convenient placement of these buttons at the front of the sound machine makes it easy to change the volume, switch the sound type, or turn the machine on and off in the middle of the night. This sound machine also includes a timer that shuts off the machine after one to seven hours–depending on how you set it. If you’re going on vacation or heading off on a business trip, you don’t have to compromise on your sleep quality. 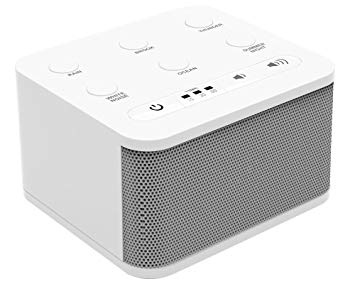 This sound machine fits into a purse or small tote bag so you can take it with you easily and get a good night’s sleep wherever you are. Fall asleep to the soothing sounds of nature and white noise side by side with this sound machine. It automatically plays six different sounds–ocean, rain, summer night, stream, white noise, and fan–on a continuous loop to offer soothing, non-repetitive audio with no breaks. Running this sound machine to help you fall asleep won’t skyrocket your electric bill or increase your carbon footprint. Its operation is extremely energy-efficient. Its auto shut-off feature that allows you to set a timer for fifteen, thirty, or sixty minutes. These short time interval options allow the sound machine to lull you to sleep without running uselessly all night long. Charge this sound machine easily using its built-in standard USB port. Also, you can take it with you when you travel due to its small, lightweight frame that fits easily into any small bag. The noises this sound machine includes are modeled after the relaxing sounds you might hear in a spa. It offers six different nature sounds, including thunder, white noise, ocean, summer night, brook, and rain. You can choose exactly how long you want this sound machine to run through the night. If you want it to run all night long, just turn it on and opt not to use its built-in timer. Or, set its auto shut-off timer to either fifteen, thirty, or sixty minutes to save energy. If you wake up in the middle of the night and want to turn the sound machine back on, just turn it on with the press of a button to be lulled back to sleep by soothing nature sounds. You can charge this sound machine using either a battery or an adaptor. These two charging options make it easier to bring the machine with you when you travel and use it even if the power goes out. 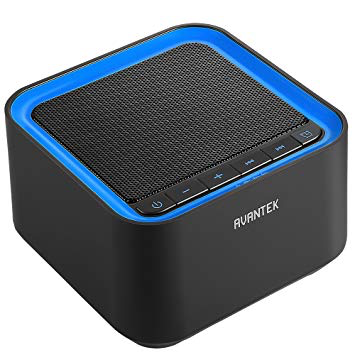 Designed to effectively mask disruptive noises, this sound machine makes it easier to fall asleep and stay asleep as well as work and study without distraction. It features ten fan sounds and ten ambient noise sounds. 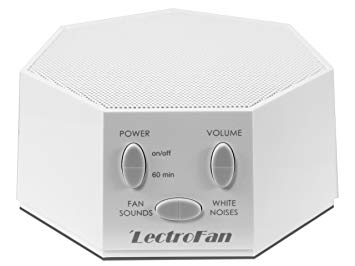 Its fan sounds include large fan, industrial fan, low mellow fan, high mellow fan, attic fan, exhaust fan, circular fan, box fan, oscillating fan, and vent fan. Its ambient noise sounds offer ten different variations of pink noise, white noise, and brown noise. All of the sounds this sound machine offers play in a non-repetitive pattern with no breaks to minimize any environmental noise disruption. Built with a large upward speaker, the sound machine distributes noise efficiently to block out any external noise. Its precision volume control also allows you to adjust the level of the noise you play to your exact preferences depending on whether you’re sleeping, studying, working, etc. Choose between six realistic nature sounds–rain, ocean, white noise, thunder, brook, and summer night–that this sound machine offers. These sounds block outside noise and help you relax, fall asleep, or concentrate while studying or working in a noisy environment. The machine’s auto shut-off timer setting allows you to choose whether its sounds play continuously or shut off after fifteen, thirty, or sixty minutes. Controlling this sound machine is easy. It features several large buttons that are conveniently placed on top of the machine. These buttons are easy to reach. You can turn the machine on and off or adjust its volume and sound settings if you wake up in the middle of the night without disrupting your sleep too much. The machine is compatible with batteries or an AC adapter, so you can still use it in the middle of a power outage or take it with you when you travel without worrying about space-sucking cords taking up all the room in your suitcase. I Need Your Clothes, Your Boots, And Your Motorcycle!